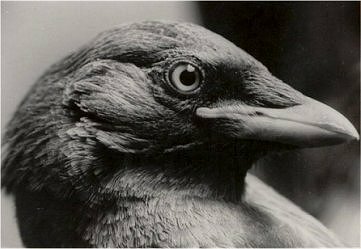 When my father was a kid he had a tame Jackdaw who obeyed him. During his life my father never could keep a friend. Sometimes he talked about the Jackdaw of his youth as the only friend he ever had trusted. If he talked about the bird he had tears in his eyes. When my father was an old man, all he did was taking pictures of Jackdaws. When he died he had no friends left, no contact with his children, and for 15 years he had lived in solitude on his farm, obsessed by Jackdaws. He left us more than 10.000 pictures of his great friends. I'd love to see more of the 10,000. This one is beautiful.